Police secure the scene of Tuesday’s fatal accident in Whitman. WHITMAN — Michael P. Barrett, 50, of Rockland was killed in a single-car crash just after 6 p.m. Tuesday in Whitman. He was alone in the vehicle, according to police. Firefighters arrived and had to cut the car open to free him with the Jaws of Life..
Barrett was pronounced dead at an area hospital. He was driving a 2009 black Nissan, which hit a tree head-on along Route 18 between Forrest and Pine streets. The vehicle struck with such force it appears to have bounced and come to a rest after the vehicle also hit a wrought iron fence, said Chief Scott Benton of Whitman Police. 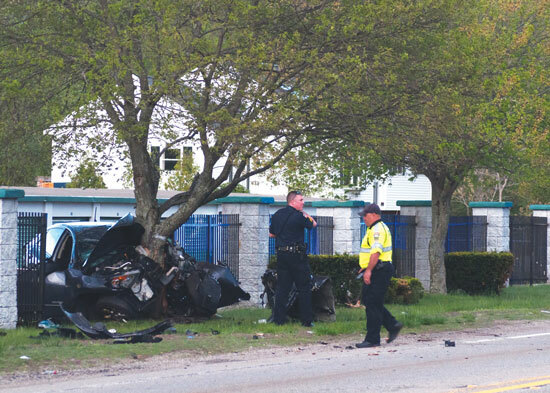 Massachusetts State Police Collision Analyses Team and Whitman Police Sgt. Edward Slocum and officer Robert Stokinger are investigating the crash. Bedford Street was closed for estimated 2 ½ hours and reopened just before 9 p.m.